This is a sea song from around Nassau. We recorded this at Ridley Pearson's house at the beginning of the Rock Bottom Remainders Wannapalooza 2004 Tour. Riddley, Dave Barry, Greg Iles, and I were the vocalists. Ridley played bass, and I played 6-string acoustic and Rickenbacker 12-string electric guitars. In his book, ' FOLKSONGS OF NORTH-AMERICA,' John Lomax offers short bits of descriptive prose to set the scene for his collected works. 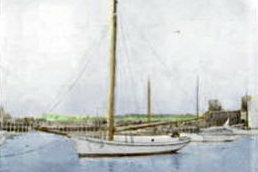 'The small boat piers of Nassau Harbor form the market-place of the Bahamas. The dirty, sea-scarred sloops, tethered on the pale blue water, are like so many country wagons loaded with produce for sale in the capital. A sixteen-footer stands in towards the dock, its deck only a few inches above the waves, carrying a cow, five goats, a dozen hens, four women, six children, and four of five sailors. This crowded little boat is ending a journey from an island, perhaps two or three hundred miles away. As it noses into the pier, a similar craft lifts its ragged sail and departs, its deck packed with passengers and freight, for some coral islet far down the chain toward Haiti. Around Nassau town we did [A7] roam. Got into a [G] – [Em] fight. Well, I [D] feel so break up, [A7] I want to go [D] home. Hoist up the John B's sails. See how the main sails set. Call for the captain ashore, let me go home. Well, I feel so break up, I want to go home. First mate, he got drunk. Broke up the people's trunk. Well, the poor cook he caught the fits. Throw away all of my grits. This is the worst trip since I've been born.